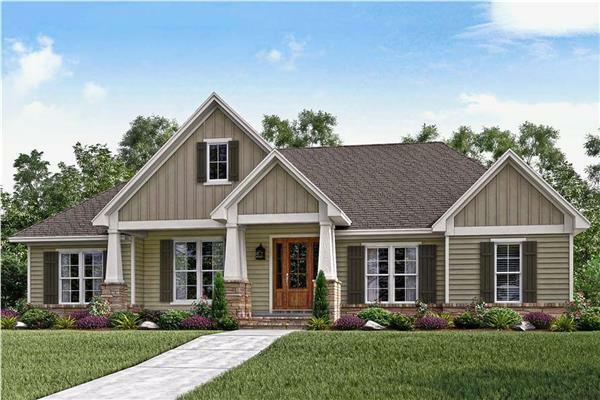 Whether for a young family looking to grow in size or a retired couple dealing with the dreaded empty nest, 2000+ square foot house plans t offer an impressive amount of flexibility and luxury at an affordable price. Many newlyweds start out with smaller homes in order to save money but quickly become pressed for space as they begin to have children. Choosing home plans 2000 to 2500 square feet allows these families to accommodate two or more children with ease, as the home plans feature three to four bedrooms in varying sizes. As any growing family knows, bathroom space is a top priority. Fortunately, 2000 to 2500 square foot house plans also commonly include two or more bathrooms, sometimes offering a half bath for additional convenience. These home plans are large enough to allow for many design choices, such as using one of the spare bedrooms as a home office or creating a dedicated playroom for the kids. The modest size also makes these plans a great choice for boomers and couples with grown children looking to downsize. Many couples find that they have too much space once their children head off to college and start their own lives, which leaves them looking for a home plan that better suits their new situation. A 2000-2500 square foot home includes enough space for the owners to live in comfort, with space for things such as hobby rooms or home exercise space, while also saving considerably on heating and maintenance costs. Because these plans also typically have multiple bedrooms, they also make it possible for couples to have their children stay with them from time to time as well. Browse through our homes of this size here.